GREEN GRAM is a rich source of low-fat protein and water-soluble fibers. Its nutritional value is high. This dal is our all-time favorite and we do enjoy various smacking dishes. This is one of the most delicious version, we love to have often. 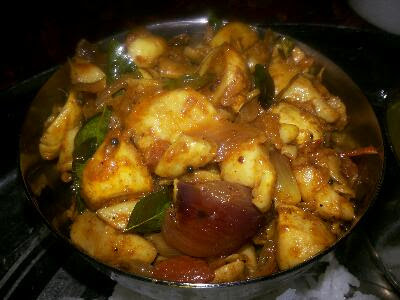 It is an amazing kuzhambu that suits hot steamed rice and one spoon of ghee. We usually dry roast until golden brown and nice aroma smell and cook the whole lentil with tomato sometimes. This is a kid-friendly curry. We grind the green gram to a coarsely textured dal to cook quickly. It takes only 15 minutes to make. The only condition is not to cook in the pressure cooker. 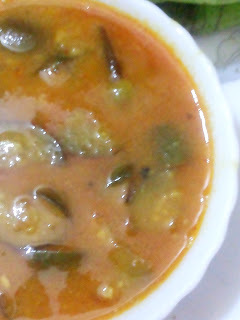 The cumin seeds give fantastic taste to this kuzhambu. excellently when enjoyed with hot steamed rice topped with ghee. We prefer this lentil here. Dry roast the green gram on medium heat until nice aroma emanates and golden brown coloured. Grind the lentils to coarsely textured. Rinse the dal only one time. Add 300 ml water and cook on medium heat. Add turmeric and castor oil. 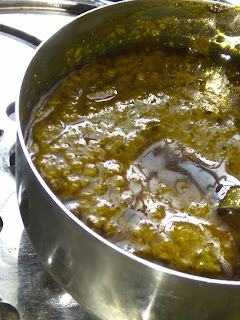 Castor oil works well to cook the dal fast and soft. It takes 10 minutes to cook the dal mashy. Add mustard seeds and cumin seeds to fry. Add shallots, green chilly and curry leaves. Transfer the dal contents to the pan. Stir well to combine all the ingredients together. A perfect companion to the hot steamed rice with one spoon of ghee. It goes very well with chappatis, warm naans and rotis.